We were at AIMS again on Dec 8, 2013 to conduct a full-day workshop on literature search and reference management. 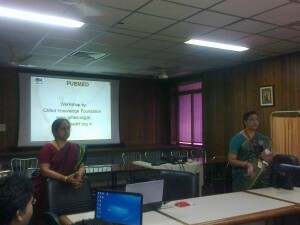 Ms Indira Nair, the chief medical librarian along with help from Dr Rajesh Pai worked hard to organize this one. They personally approached HOD’s of various departments to spread the word about this workshop. We require individuals and institutions to put such efforts to create awareness about literature searching till the day the system makes it mandatory for health professionals and students to know these skills. This workshop saw a mix of students and faculty members. As always, the participants were dedicated and had a quest to learn. A few of the participants mentioned about using Zotero for reference management though this did not stop them from learning Mendeley. The more we do such workshops the more we realize that learning literature search skills and reference management is an essential aspect of the medical education. Thank you for simplifying literature search and storage and even retrieval and citations. This session could not have come at a better time, as I have just begun work on my thesis. The easy to understand class and hands-on experience was priceless. Very good session. Made my nightmares of PubMed search a thing of the past. This should be conducted every year from a new batch joins on MD/MS/DM/MCH course so the approximately 75-100 candidates can benefit. Thank you and please send us the manuals and updates by email.